Incoming undergraduate students enter directly into the professional Bachelor of Science in Community and Regional Planning (BSCRP) degree program. A limited number of students are admitted into the program through transfer from other programs or institutions. Our curriculum helps prepare you to address a broad range of planning challenges involved in managing the social, economic and physical change of neighborhoods, small towns, cities, suburbs, metropolitan areas, regions and states. The curriculum provides a progression of courses in principles of planning, planning methods, and related topics. Studios provide synthesizing experiences in a range of applications through practical, hands-on experience working with communities, or other organizations. View BSCRP learning outcomes (PDF). 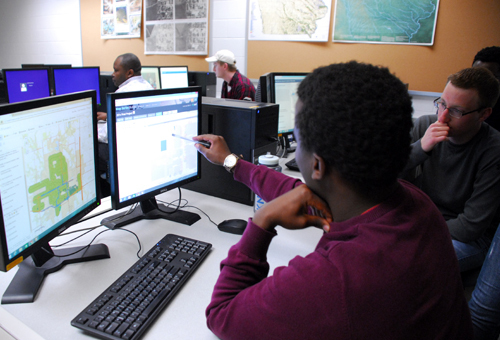 A number of students choose to take advantage of our graduate certificate program in GIS to further develop the important skills of spatial analysis and representation. While focused on the communities and regions of Iowa as the basis for hands-on experience, students are also encouraged to participate in field travel classes where we study planning issues in places like New York City, New Orleans or Los Angeles, or in the College of Design’s Rome Program or other international study opportunities. Students are also sought after as interns in planning agencies and firms during their academic years. Beyond meeting the minimum high school requirements for admission to Iowa State University and the College of Design, students intending to major in Community and Regional Planning may find a number of classes very helpful in preparing for college coursework. Courses in sociology, economics, political science or government, environmental science all provide useful context and content for planners. Because planners typically work with many (sometimes competing) groups and often make presentation to city councils or other decision-making bodies, courses in public speaking, debate, writing, and graphic communication will also serve you well.